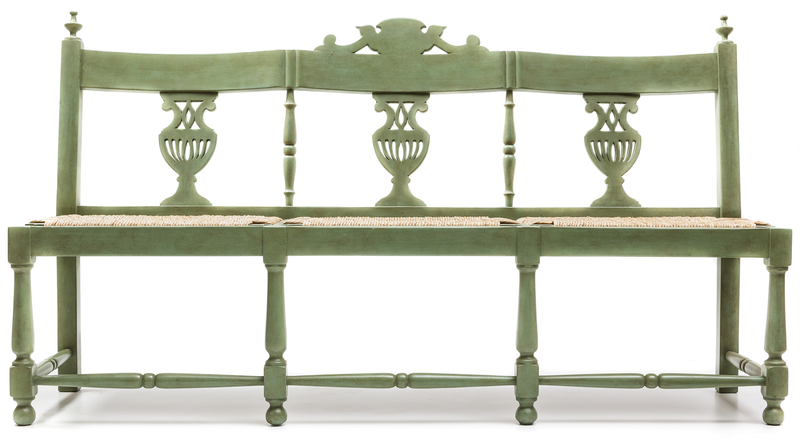 With its soft lines, and fret-work and trimming decorations, this 3-seater bench is handmade with careful executive skills. It is characterised by a stylistic originality that reinterprets balanced formal synthesis. 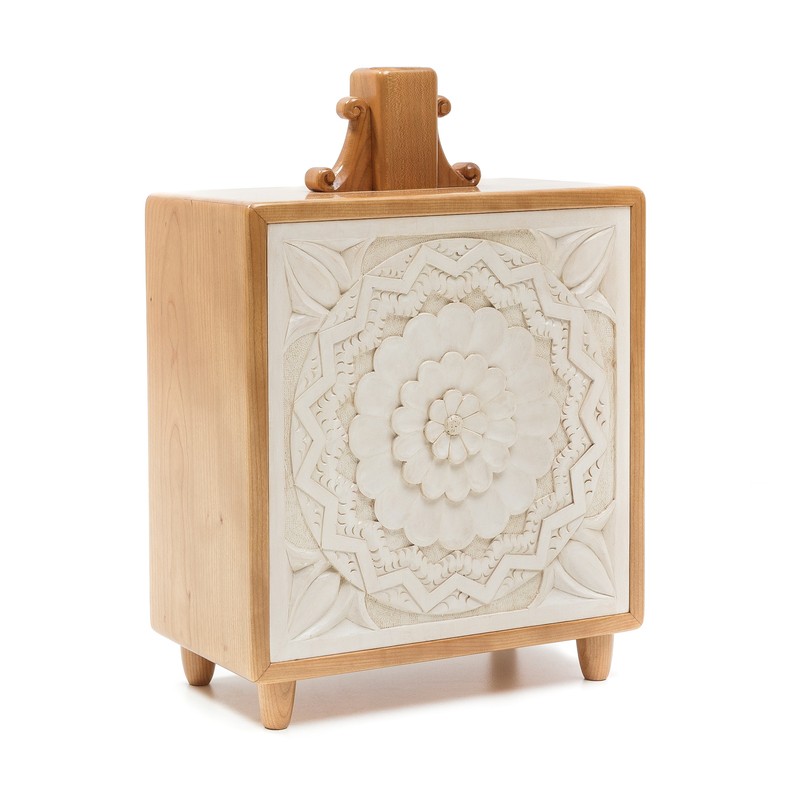 The basic shapes of the square around the rosette motif, inspired by the wedding chest typical of local tradition and performed with detailed incisions and great artistic sensitivity, remind a precious lace. 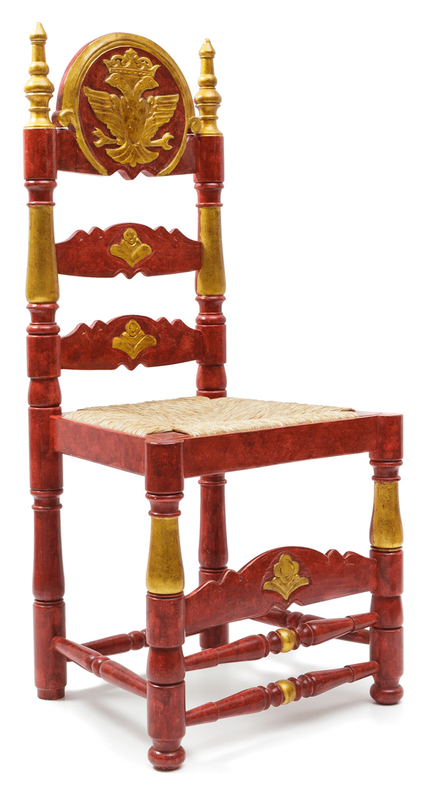 Being precious and scenic, the wooden chair includes moulded elements displaying the coat of arms of the Augsburg and richly decorated with gold leaf on a lacquer coating. Made of poplar wood, it is available in different color combinations. 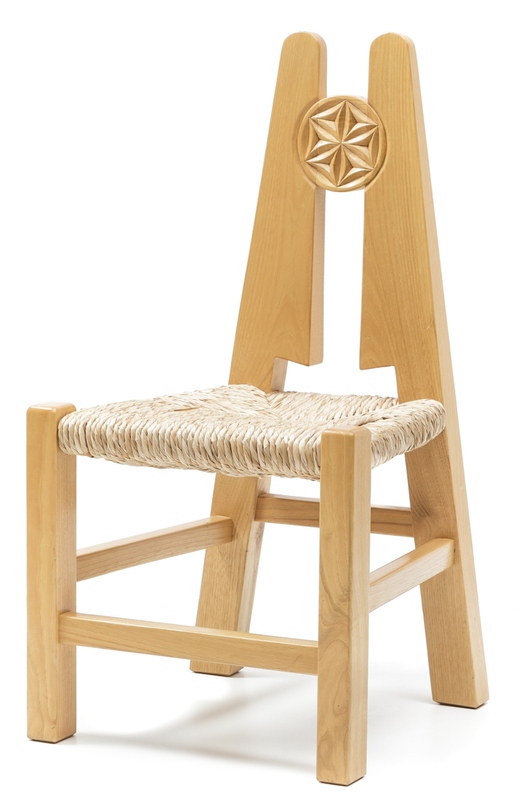 The”Sedattu” chair is the result of a successful design project, created by talented designer and artist Giovanni Antonio Sulas at the Farris joinery of Nuoro, that reminds the low chair used by the hearth in the Sardinian tradition reinterpreting the forms with innovative synthesis and dynamism. 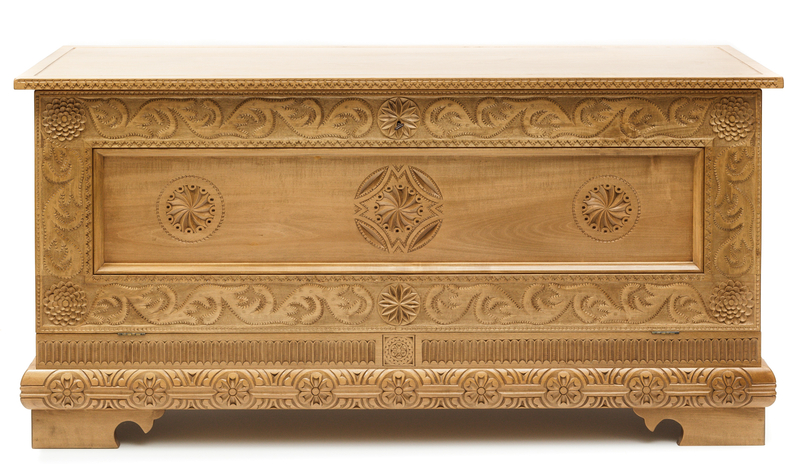 It reinterprets the Sardinian tradition chest with skilful craftsmanship, and offering a refined monastic touch called "Gesuita di Oliena"; the precious cabinet is handcrafted using lime wood and decorated with valuable and original incisions. To Pasquale Farris, a skilful and refined master joiner and carver, woodworking is a skilful artisan expertise inherited from his father Giacomino. The rich history of the Farris family workshop is reinforced by the unique relationship of friendship and collaboration with Giovanni Antonio Sulas, artist-designer and educated connoisseur and innovator of Sardinian handicraft tradition and prominent interpreter of the birth 1960s “Costa Smeralda” project, operated by Karim Aga Khan. Sulas' suggestions were valuable artistic guidelines for Pasquale and his father, combined with the executive fineness that characterizes the work of this talented artisan, led to the creation of a fine production of high-quality furniture, often embellished with carved decorations of rare beauty. In his workshop, Pasquale Farris crafts objects of fine and rare beauty, the result of careful manufacturing combining with elements of extraordinary effectiveness typical Sardinian tradition and contamination with other styles, such as Spanish and Italian, to create new designs. These timeless objects that show the taste and expertise of the artisan are inspired by the rich and cultured past, and are a striking example of exquisite craftsmanship. Each piece is unique and can be customized according to the customer’s requirements. Pasquale Farris performs all the classic techniques typical of woodworking to make robust furniture and accurate finishes. He crafts precious decorations with painting and the gold leaf technique. It is characterised by skilful carving and artistic sensitivity.